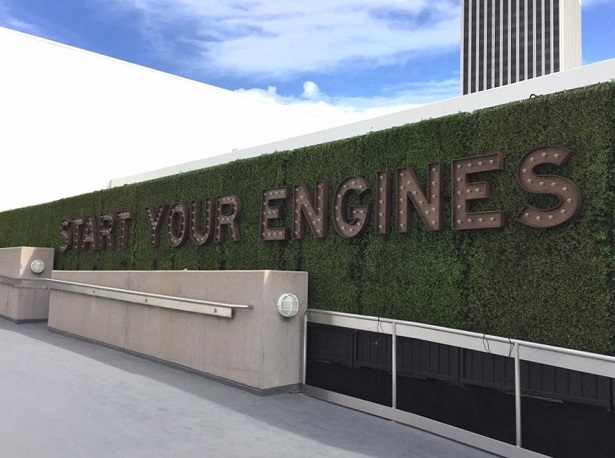 Petersen Automotive Museum Is Fun For the Whole Family! 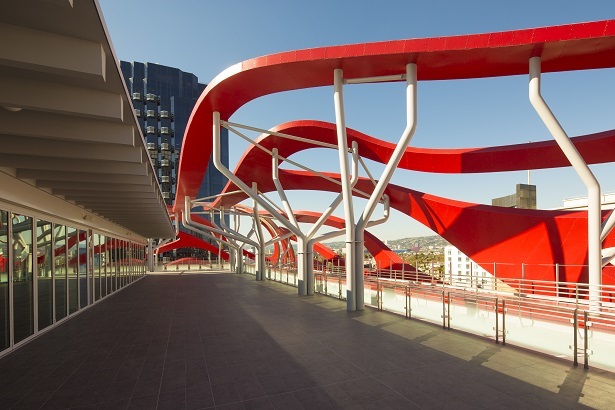 But first, let’s stroll over to the third floor of the Petersen Automotive Museum! 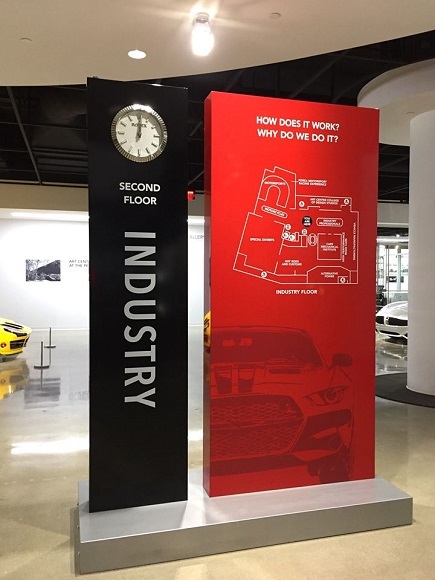 On the third floor you can check out concept cars and art or snap a photo at the Ford Model T Photo Op! The area that I lingered at the most is the Hollywood Gallery where you see the cars of film & television. 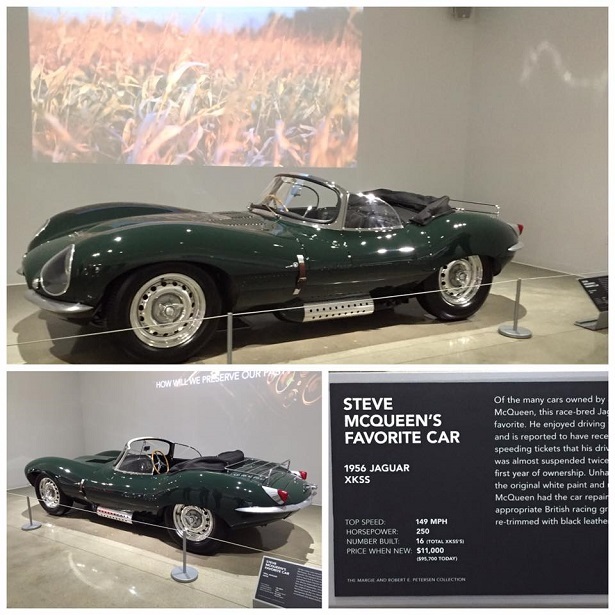 Here is Steve McQueen’s favorite car! As you can see from the photo, there is a grassy field projected onto the wall behind the car. That is actually a short film that play on a loop! Here is a snippet of it. I really liked how they used film & pop culture within the car displays on the third floor! We all know that James Bond is a car aficionado. 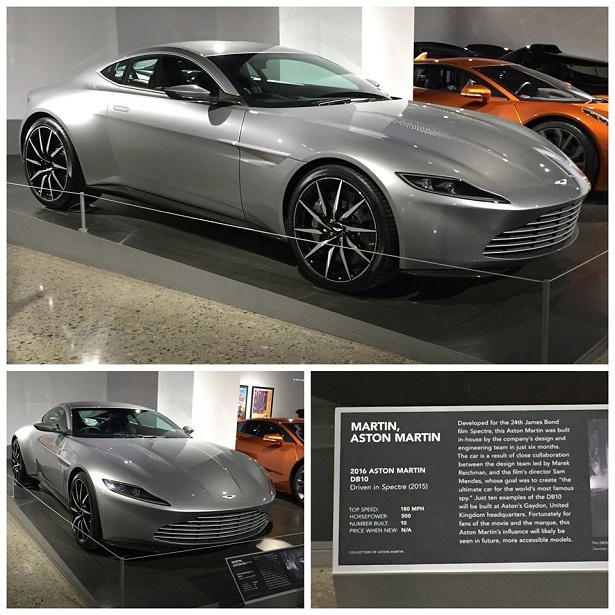 So it should come as no surprise to see the Bond car used in the film Spectre! Other pop culture cars worth mentioning, the Lincoln Continental convertible that the boys from Entourage drove, Walter White’s car from Breaking Bad & even the Batmobile! The second floor houses the Art Center College of Design Studios (yes, I was told that those are real design students inside the conference room) & an alternative power section. There is also a motorcycle exhibit & even the Forza Motorsport Racing Experience! There is a lot of concern about air pollution & dependence on foreign oil. So I found the Alternative Power section of the museum fascinating! 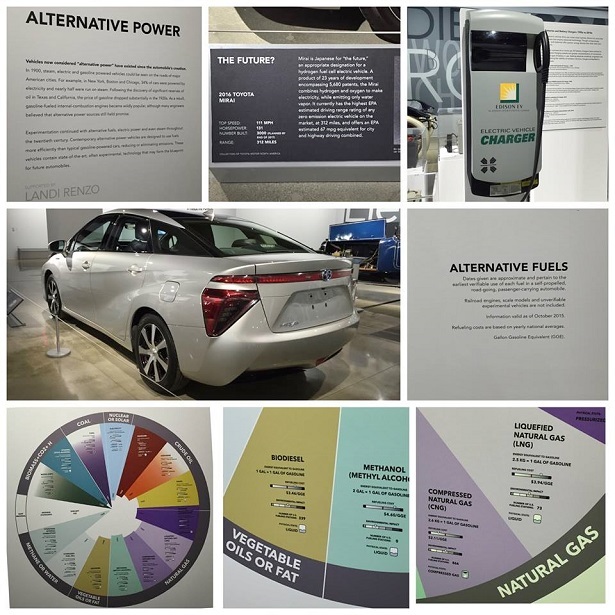 There was a wealth of information on the use of alternative fuels. 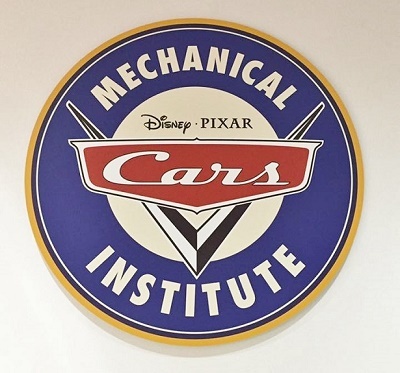 The one area that is by far the most entertaining is the Pixar Cars Mechanical Institute and CARSpad Experience! 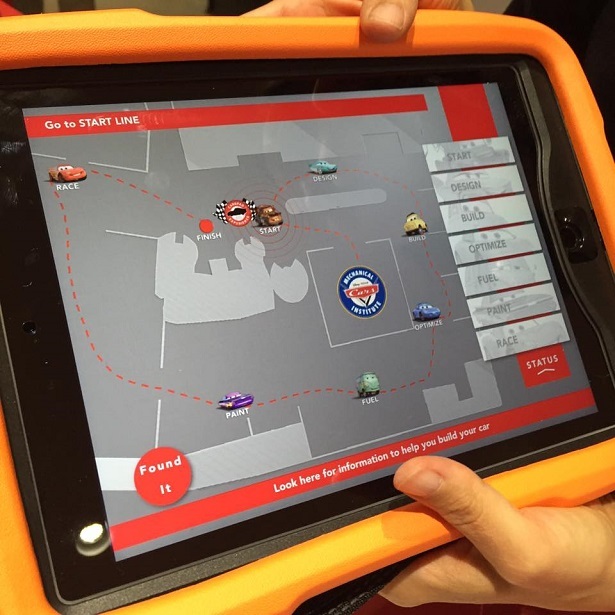 Kids of ALL ages can check out special CARSpad tablets from the Cars Mechanical Institute. You’ll then take the tablet & search for certain icons in the museum. Then you hover it over the icon & Mater from Cars will take you through the fun exercises. Here is a snippet of what you will see! FYI, you may have to turn the volume up a bit to hear Mater. With the CARSpad, you’ll be able to design a car from the ground up, paint it & then put decals or spoilers on it. At the very last stage, you can race your car that you designed against Lightning McQueen! 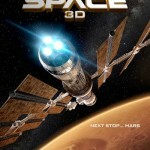 The whole experience is about 20-40 minutes depending on how many stages you decide to go through. If you are limited on time or your child is of a certain age that doesn’t have the attention span to sit through everything, then you can skip through some of the sections & just go straight to painting your car. 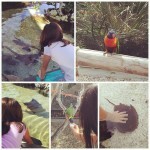 (Love it!) Then your lil’ one can race his or her custom-painted car against the Cars character. I personally know a few adults who will want to do this activity, so it is truly a multigenerational experience! There are three other separate stations within the Cars Mechanical Institute where you can play! 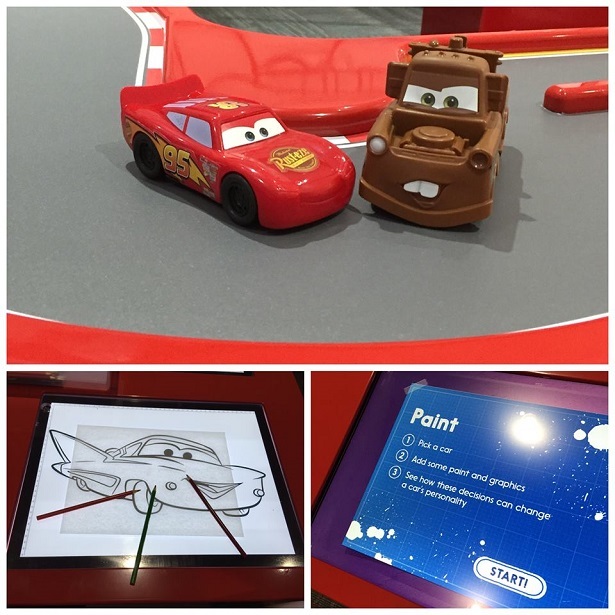 Kids can draw different CARS characters on paper, race their Lightning McQueen or Mater around a racetrack or paint a car on the computer. 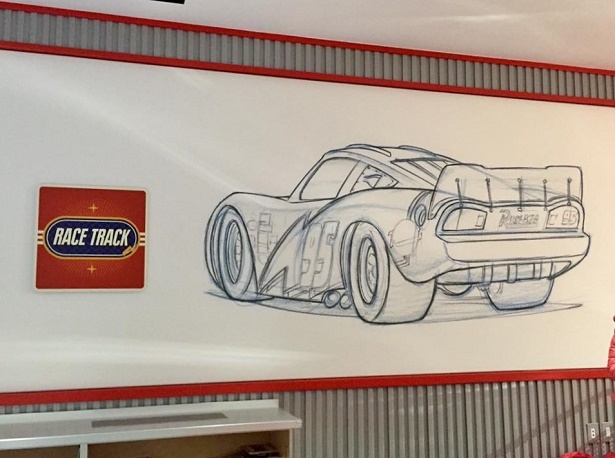 I was fortunate to interview Jay Ward, the Creative Director for Disney/Pixar Cars. 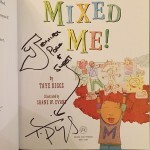 Stay tuned for my recap of that interview later in the month! 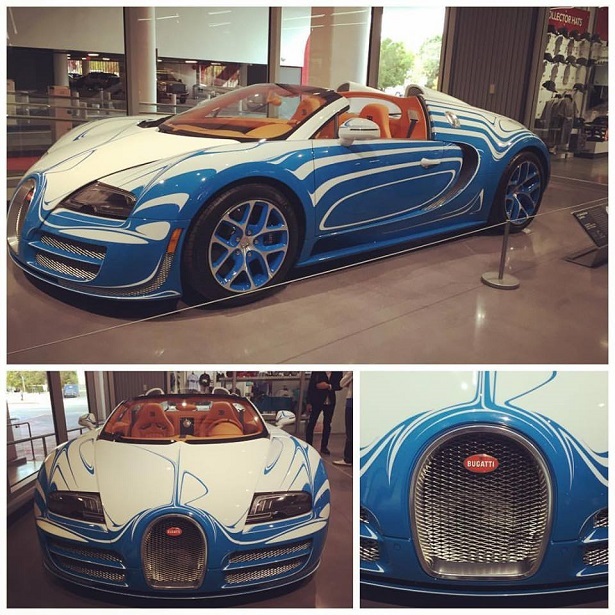 The first floor of the Petersen Automotive Museum contains the Art & Design Gallery, the Armand Hammer Foundation Gallery & an exhibit called “Artistry of the Automobile.” I was wowed by this Bugatti that was displayed in the lobby! For museum hours & information, click on over to their website & be sure to “like” them on Facebook so that you can get the latest updates! Disclosure: No monetary compensation was received for this post. I attended a media event which helped facilitate this review. All images are my own unless otherwise noted. As always, my opinions are 100% my own. 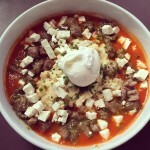 Checking Out The Federal Bar’s Brunch Menu! Excellent post. 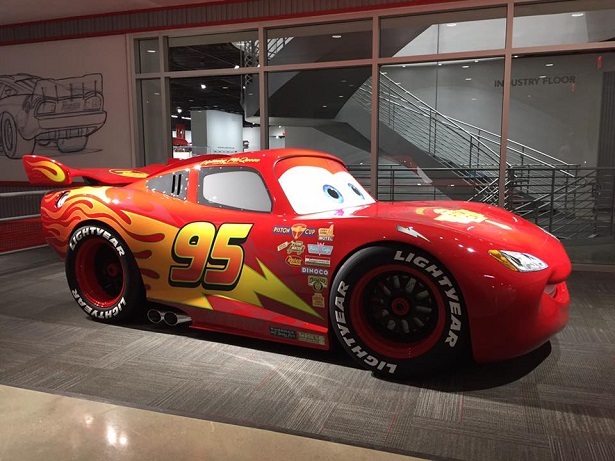 I didn’t know about the Pixar Cars exhibit. I have family coming for the holidays and my nephews are Cars fanatics! Thanks Elizabeth! I agree, this will be a great activity for your family visiting during the holidays. Enjoy! WOW very beautiful renovation to the museum, I was a very small part of the museum as in one of the automotive artist selling prints of my work in the museum store. I was fortunate enough to also design a CD style desk calendar for the museum and design a poster for one of the many special events held at the museum sponsored by Lincoln. 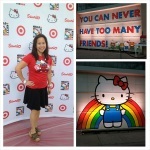 I sure miss being a small part and hope to return to LA to visit the new museum.